Recommended measures for people caring for those infected with Ebola include the wearing of protective clothing including masks, gloves, gowns, and goggles. The CDC recommends that no skin be exposed. These same measures are recommended for those who may handle objects contaminated by the infected person's body fluids. In 2014 the CDC began recommending that all people receive education on the proper suit-up and removal of personal protective equipment and that someone should be watching each step of the procedure to make sure it is done correctly. Figure 1: Ebola prevention through personal protective equipment. The infected person should be in barrier-isolation from other people. All equipment, medical waste, patient waste, and surfaces that may have come into contact with body fluids require disinfection. During the 2014 outbreak kits were put together to help families treat Ebola in their homes which includes protective clothing as well as chlorine powder and other cleaning supplies. Ebolaviruses can be eliminated with heat (heating for 30 to 60 minutes at 60 °C or boiling for 5 minutes). To disinfect surfaces, some lipid solvents such as some alcohol-based products, detergents, sodium hypochlorite (bleach) or calcium hypochlorite (bleaching powder), and other suitable disinfectants at appropriate concentrations can be used. Education of the general public of the risk factors for Ebola infection and of the protective measures individuals can take is recommended by the World Health Organization. These measures include avoiding direct contact with infected people and regular hand washing using soap and water. Bushmeat, an important source of protein in the diet of some Africans, should be handled with appropriate protective clothing and thoroughly cooked before consumption. Some research suggests that an outbreak in the wild animals used for consumption may result in a corresponding human outbreak. Since 2003, such animal outbreaks have been monitored with the aim of predicting and preventing Ebola outbreaks in humans. Figure 2: How to prevent ebola from further spreading. 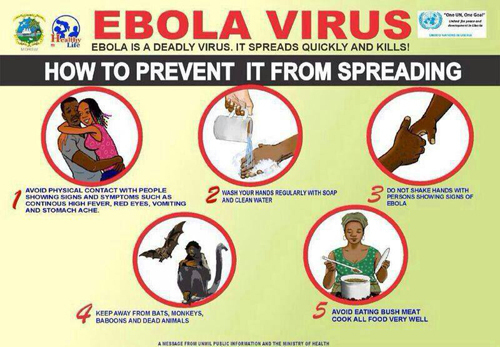 If a person with Ebola dies, direct contact with the body should be avoided. Certain burial rituals, which might have included making any kind of direct contact with a dead body, require reformulation such that they consistently maintain a proper protective barrier between the dead body and the living. It is recommended that the bodies of people who have died from Ebola be buried or cremated only with proper care. In laboratories where diagnostic testing is carried out, biosafety level 4-equivalent containment is required, since ebolaviruses are World Health Organization Risk Group 4 pathogens. Laboratory researchers must be properly trained in BSL-4 practices and wear proper personal protective equipment. Isolation refers to separating those who are sick from those who are not, while quarantine refers to separating those who may have been exposed to a disease until they either show signs of sickness or are no longer at risk. Quarantine, also known as enforced isolation, is usually effective in decreasing spread. Governments often quarantine areas where the disease is occurring or individuals who may transmit the disease outside of an initial area. Contact tracing is regarded as important to contain an outbreak. It involves finding everyone who had close contact with infected individuals and watching for signs of illness for 21 days. The CDC states that during the 21 day timeframe, persons should self-monitor for fever twice daily and notify the public health authority if fever or other symptoms develop. If any of these contacts comes down with the disease, they should be isolated, tested, and treated. Then repeat the process by tracing the contacts' contacts. The risk of a tourist becoming infected with Ebola virus during a visit to the affected areas and developing disease after returning is extremely low, even if the visit included travel to the local areas from which primary cases have been reported. Transmission requires direct contact with blood, secretions, organs or other body fluids of infected living or dead persons or animal, all of which are unlikely exposures for the average traveller. In any event, tourists are advised to avoid all such contacts.